06 Dec 2018 / 23:15 H.
PARIS: Around 200 French high schools were blocked or disrupted Thursday by students protesting a raft of education overhauls, on a fourth day of action called to coincide with anti-government demonstrations which have rocked the country in recent weeks. “The situations are quite varied, with total or partial blockages, barricades to control access, burning pallets,“ an education ministry official told AFP. The “yellow vest” protests began on Nov 17 in opposition to rising fuel taxes, but they have since ballooned into a broad challenge to Macron’s pro-business agenda and style of governing. 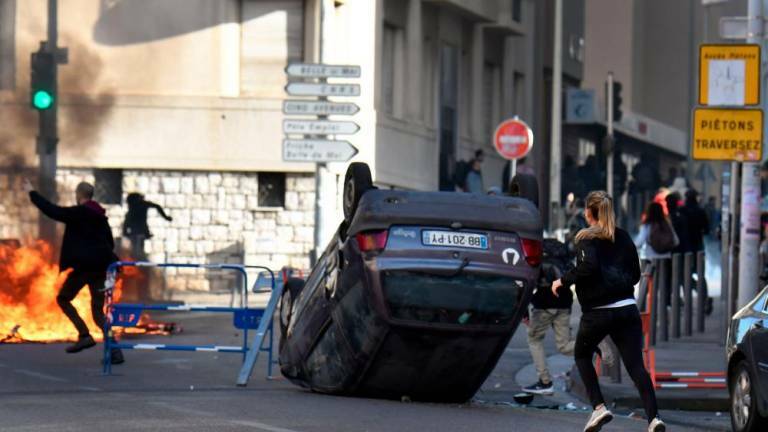 “With the yellow vests as a pretext, we’re seeing all sorts of individuals joining with people demonstrating in good faith, including students, and this is leading to serious violence,“ Education Minister Jean-Michel Blanquer told BFM television. Four people have died in accidents linked to the protests since they began on Nov 17, and hundreds have been injured. Macron, whose approval ratings are down to just 23%, has not commented publicly since Saturday on the deepest crisis of his presidency so far. Despite last weekend’s violence, attributed by many to vandals intent on rioting, public support for the yellow vests has remained stable, with an opinion poll this week showing 72% backed the movement.